If you are one of those people ready to set fire to your computer after reading the headline, please click the “back” button or find your way to an angry Mets fan forum. Those with open minds and an appreciation for talent that extends beyond a flat change-up to Yadier Molina in October 2006, please read on. Finally, Aaron Heilman is a free agent, and with that has the opportunity to shop his wares to a team willing to give him a shot as a starting pitcher. If you are a longtime reader of MetsToday, you know I’ve advocated and supported the concept for about as long as I’ve written this blog. Unfortunately for Heilman, he’s now 32 years old and hasn’t started a big-league game since 2005; in other words, it’s an uphill battle for him to convince someone that he can fill a spot in their rotation. It’s also a damn shame, considering that Heilman’s arm was abused in a role not suited to his delivery, rather than leveraged for starting duty. I doubt he would have been a Cy Young candidate, but Heilman could have been a very solid #3 / #4 starter on a playoff team had he been used properly. Beg to differ? Then you didn’t see or properly evaluate Heilman’s repertoire as a Met from 2005-2007. He threw two fastballs: a four-seamer that sat at 95-97 MPH and a hard sinker that rode in the 92-94 range. Complementing that was one of the top-ten changeups in all of baseball and a plus slider, along with a forkball that he mixed in as an alternative to the changeup. That’s four good pitches and a fifth for “show”; enough to get through 6-7 innings every five days, dontcha think? However, Heilman was stuck in his relief role as a Met, partially because he was “too valuable” in the bullpen but mostly because his presence as a leftover from the previous regime and his outspoken desire to start irked Omar Minaya. Heilman was supposed to be inserted into the 2006 rotation after stretching out his arm in winter league, the trade of Kris Benson to Baltimore, and the acquisitions of relievers Jorge Julio and Duaner Sanchez. Despite outpitching everyone in spring training, the Mets instead sent Heilman back to the bullpen and handed rotation spots to Victor Zambrano (gasp! ), Steve Trachsel, and Brian Bannister. A similar facade was played out in the springs of ’07 and ’08 before the Mets traded Heilman and 37 other players in a deal to acquire Sean Green and two other guys from Seattle. I never quite understood why the Mets were so inept in the handling of Heilman’s talent, but if I had to guess I’d say it had something to do with egos and a power struggle. At this point, I have no idea if Aaron Heilman can still be a starting pitcher in MLB. I know he could have filled a spot in the middle or back end of at least 20 (maybe 25) big league rotations five years ago, as well as four years ago and three years ago. But I haven’t seen enough of him in the past two years to know what he has left in terms of command and velocity. It may be too late at this point, but at the same time, Heilman is no longer anywhere near the special reliever he was from 2005-2007. That said, I hold hope that someone, somewhere, will sign him to be a starter, just to see what might happen. Joe – I agree with the gist of your post on Aaron Heilman. I have always thought the Mets handling of him was extremely short-sighted. In Heilman, they had a Notre Dame grad who went something like 15-0 his senior year, with a number of complete games. He knew how to pitch his team through to victory. Here’s an example: In 2005, he one-hit a potent Marlins line-up. The next time he faced them the Marlins hitters made some adjustments and he wasn’t as effective. He never had the chance to make his adjustments a third time through. Developing a starting pitcher is in part a process of refinement, which is something the cerebral Heilman could handle with aplomb. Unfortunately, the Met heirachy, until very recently, wasn’t quite as cerebral. heilman’s knock was he could get thru the order once, maybe twice. i think the ‘adjustments’ rested in heilman’s head. he had the tools…but not the moxy. Me, Aaron Heilman will forever be linked to Yaddy molina. Also his Blown saves in 2007 including one early in the yr that shoulda been an Elduque gem also stand out when you see the season came down to one game. as is we NEED him now, as a set up man/ closer again. Mic, have to disagree on all counts. First, Heilman made only 7 starts after going back to his “old” mechanics, so I don’t believe that’s enough of a sample size to form an opinion such as “he can’t get thru the order more than once”. Further, John Maine had that “knock” and he was given three years to prove it correct. Second, “moxie” is a subjective analysis and difficult to prove one way or the other. Still, I have a hard time believing he lacked it. More likely, he pitched in so many games — and in so many high-leverage situations — he was bound to blow some of them; no one is perfect, after all. If anything, he SHOWED moxie by appearing in game after game, frequently on short rest, and never spent a day on the DL as a Met despite chronic elbow issues. As for the Mets “needing” him as a setup man/closer, well … I’m dumbfounded, since you seem to have established the opinion that he can’t mentally handle such a role. 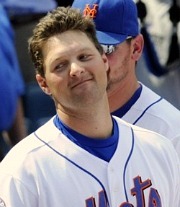 Further, why would the Mets “need” a late-inning reliever in a rebuilding year? Moreover, I’d say they’re more desperate to find starters — otherwise there won’t be many games to hold/save in the late innings. No matter — there’s a better chance of a blizzard in Hades than Heilman returning to Flushing. I still recall my bewilderment in the Mets not giving Heilman an opportunity to start. He did well in the very few chances he was given. Until I’m proven wrong, I think the Mets now have one of the brightest and most experienced Front Offices in all of baseball. If, indeed, Minya had some sort of problem with Heilman, that’s now out of the equation and we’ll see if the new Front Office gives Heilman an opportunity. Thanks for writing this piece because you will have helped in putting Aaron on their radar. I swear to God, you absolutely channel me. You were dead on about Dan Wheeler and a previous column about Heath Bell. I also thought that Heilman had proved himself in previous starts and more than earned the right to start in 2006 by going to winter ball and then following that up with a solid spring. Letting him start was a win-win situation. The guy obviously felt he could and should have been a starter. So if you gave him the first half of 2006 to start and he succeeds as a #4-type starter (averaging 7 innings per game, ERA around 4.00) then everybody wins. If he didn’t succeed (averaging 5+ innings, ERA over 5.00), then maybe he returns to a relief role with a better attitude, knowing that he was given the chance as the organization had promised. Instead, he was jerked around and was obviously bitter about it. I agree. Omar just had an issue with him and it was compounded by Willie’s misuse of him in the pen. It’s a shame because Aaron was a good guy who deserved better. Ha! Glad I’m not alone … talking to most Mets fans, I certainly felt alone in my opinion of Heilman. It would have been interesting to see what might’ve happened had the Mets kept Wheeler, given Bell a fair shake, and put Heilman in the starting rotation. Who knows? Omar Minaya might still have a job in Flushing today. Could it be that the baseball god’s have instituted a Heilman Hex for those teams that refused to start him, in spite of significant need? The Met’s since 06, the Cub’s and more recently the Dbacks sure seem cursed, and even Seattle tanked after trading him away. He pitched in 70 games last year, with a 4.5 ERA. At one point it was below 3. Taking out 7 appearances where he was very heavily used, including a career first 4 in a row, his ERA would have been 3. As far as boo birds go, just consider the source and ignore or pity when appropriate. Well, the Mets clearly are in need of help with the starting rotation and are looking to do so on the cheap, and the egos you note are no longer with the team, perhaps this coming season the stars align for Heilman to start for the Mets. Should that happen there will be a noteworthy number of fans who will lustily boo upon his being introduced on Opening Day so not only does he have no recent history of starting to support his case he would have an angry fan base antagonizing him at every opportunity. Thus despite the fact that there would seem to be a match between the 2011 Mets and Heilman perhaps it’s best for all parties if he takes an shot at someone else’s rotation. Jay, I have to agree — there are many Mets fans who have only negative memories of Heilman and wouldn’t provide positive support. Which is why I didn’t suggest that the Mets sign him this winter — even if it does make sense from the standpoint of him being fairly cheap and the Mets needing arms. That’s one of the most frustrating aspects of being a Mets fan…coping with the impatient Mets fans. How this fan base can continually antagonize players is just beyond me. It’s like the whole booing David Wright thing. For that reason, there’s no way that Heilman could come back. There’s just too many idiots out there that would never give him a chance. For one of the most sophisticated markets in baseball, we sure are a bunch of crazy nuts. Good stuff. Are we rebuilding? with a $130m payroll, no trades or even significant rumors of trades I can’t use the term ‘rebuilding’ ……. As for Aaron, agreed the boo birds ran him out and would not allow him to settle in. Actually I made a mistake – the Mets are not “rebuilding”, they are “assessing”. Despite acquiring three very smart former GMs and two high-powered computers, it’s still going to take a year or so to figure out what to do with the organization. In the meantime, they’ll be keeping an eye on the Wilpons’ money (what’s left of it). Assessing is as good an explanation as any. Let’s hope that this fan base has the patience to recognize the plan. how great would it be if we shed the miserable trolling portion of our fan base, it would be worth it to have a shruken payroll just to have “adult” conversations about baseball, and not sifting through countless posts when a guy like Hu is traded that read “world series here we come” ; each poster more convinced than the last of their bitting wit and comedic prowess. I also believe the Mets screwed Heileman in 2006. He just barely lost out to Bannister in spring training for the #5 starter’s job. (One of the reasons was because Bannister did not have experience relieving). Then, when Bannister and Zambrano went down, you would think that Heilman would get another chance? No, instead, the Mets run out Jose Lima, Geremi Gonzalez & Alay Soler before trading for Orlando Hernandez. Then, when Pedro goes down, they bring up Maine & Pelfrey, and even give Lima another shot instead of letting Heilman start. Later, Dave Williams & Oliver Perez were in the rotation. Even though the Mets kept winning, Heilman seemed to be the only person at Shea Stadium that was not enjoying the summer of 2006. I always thought that once he became a free agent, he would go on to become a successful starter. Since he has experience playing in New York, he seems an ideal candidate to challenge for the #4 or #5 starting job…. for the Yankees! You had me at Jose Lima …. Is armando benitez still available? why don’t we give him another chance. He was still throwing seeds in Newark at the end of ’09, but haven’t seen him since. I bet he’d come cheap. While the Mets kick around the idea of bringing him back, no one has asked if Aaron Heilman would want to come back to the Mets? He left on some pretty bad terms, maybe “bitter” with how he was treated here? Thoughts? Good point, Andrew. At this point, though, I think Heilman would be interested in talking with anyone who will offer him a shot at starting — it’s really his only chance of increasing his value over the next 2-3 years. Don’t think the Mets would offer enough to temp him, And the boo birds would have a field day anytime he was less than perfect. You are assuming there will be birds in the stands to “boo”. Considering that the team has stunk the past two years, and is planning to stink again in ’11, there won’t be many over-paying for the privilege of watching a last-place team. Though, an empty Citi Field will resemble an echo chamber, so any boos could sound louder than they should. I wonder what it will take to remove the self inflicted Heilman Hex from the Mets? Maybe overpaying him for 2012-2015 after he proves he can still start somewhere else in 2011? If my memory is working, I felt the Mets actually threw away a couple seasons simply because they wouldn’t start Heilman even though a couple of years their starters were dropping like flies. I was sooooo angry. They desperately needed starters and Heilman had proven (in the few games they had given him to that point) that there was a chance he could actually be a VERY good starter, and the Mets kept grabbing guys from here and there to try out who obviously had nowhere near the talent Heilman had shown. Seriously, that situation of the Mets constantly denying Heilman that shot when they so desperately needed quality starts is about the angriest I’ve ever been over one subject because I really believe it cost us some postseasons and probably still is today. I know it was said earlier that he probably wouldn’t have been a #1 or #2 starter, but I really thought it was possible. Especially with the offense we had back then, I pictured him being a consistent 15 to 17 game winner and how many of those have we had? 2) Less wear and tear on the bullpen, which contributed to poor late season performance and possibly Wagner’s blown elbow. The Met’s saved pennies by keeping him in the pen, and probably went through well over 50M in an unsuccessful effort to replace him. And the Putz/ K-Rod fiascoes would not have happened, since they would have concentrated on improving the bullpen, and acquire or develop an arm that could eventually replace Wagner, instead of chasing after a starter the already had. Wow … never thought of it that way … kind of like a “butterfly effect”! “Butterfly Effect” (had to look that one up) exactly describes it. Extremely appropriate to use a chaos theory term to explain the Mets during the reign of Omar. I wonder who cost the Wilpons more, Madoff or Minaya? Me too … but I guess you figured that out by the many, many posts I wrote about Heilman from 2006-2009!